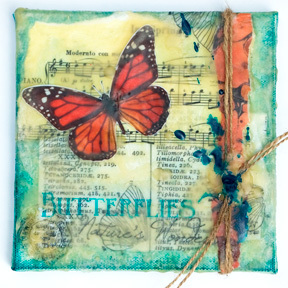 Learn how to mix canvas, stickers, stamping, beeswax and more in this lovely mixed media collage. Click here to watch a great instructional video from Lucy Hill Edson for Stampington and Co. The mixed media site Schmooze with Suze is have a Cyber sale from now through Wed. Dec 2nd, enter Cyber Monday at checkout and receive 22% off your purchase.